I had an interesting week, as Egg Shen would say. You know that old Mooshu curse? “May you have an interesting life.” To start off the day on the second, I was awakened from my comfortable sleep in my nice jail cell by a couple of officers. I’m not sure why they were looking for me. Had something to do with me being of the seed of my late parents. Oh well, I suppose the cannon shot dropping all around the fort would have woken me anyway. Turns out that the cannon shot was precisely what they wanted me for. I met an unsavory sort name Captain Avery, who appears to be running the fort. He said I was just the man to stop the cannons the Troggies had turned on them. I read that as “expendable”. So I figured that since returning to my nap was probably out of the question, my new first mate (by virtue of him being the only crewman I had) and I took off and made the Troggies much quieter. Since I don’t have a ship, I’m still not exactly clear on why I need a first mate. But since he’s good and smacking around frogs, I certainly don’t mind him hanging around. During the fighting a crazy Scot named Bonnie Annie joined my crew becoming my first mate. On a privateer’s crew, crazy is a virtue. Next thing they wanted was for me to take out the Cutthroats skippered by Fin Dorsal who were holed up in the mountain. Seems he stole Avery’s Jade Amulet. Not too tough a task, Fin’s all splash and no snap. Avery was happy with the amulet and he promised me a ship for another task he had in mind. After some crew training, I put Shen back in as first mate now that I’m fairly sure that Annie won’t accidentally (or on purpose) shoot us from behind us. I found Ensign Emmett in the cellar of the Kraken Skulls attempting to hire Ratbeard to find Gunn’s gold. Ratbeard, of course, double crossed Emmett and a whole lot of fighting ensued. Ratbeard got away with Gunn’s Will and I got a new first mate. For this Avery gave me a ship. Well, a boat. Okay, it’s basically some floating wood with a cannon on it. The Grinning Sky Slug is the name and I think it fits it. The maiden voyage was nearly a disaster. We took off for some simple batacuda fishing. A young lad on the island was paying us to find his father’s dagger in the belly of one of the fish. The fight would have been pretty tough but another captain joined in with us and a lot of her big muscle came too. Yeah, I said her. They’ll let anyone be a Captain in the Spiral these days, even girls. Got to admit, didn’t mind the view though. Oh, I mentioned a near disaster… well, just as we had finished up with the fish my crew and I fell to a strange sickness. Unconscious, I am told by other sailors that we drifted toward a blockade and then almost into a Monquistan ship. Then we drifted close enough to another ship, probably out of Marleybone, who started shooting us to pieces. How we survived that is uncertain. The friendly good looking captain and her crew ended up stranded on the beach at Skull Island. When we came to, we were northwest of Skull Island and in the midst of a fairly pissed off armada of Monquistans. We couldn’t get the ship to dock so we had to beam out. We were all surprised we survived that. We were even more surprised to find that, not only did we get the gold, I had Young Alex’s dagger in my coat. So, clearly I’m a great sailor, with nothing but a bit of floating wood and a cannon, I can sail even in my sleep. But just to be on the safe side I stopped and got some bigger cannons. After a lot more fishing I put into Jonah. I got hired out there on some new jobs. At the end of the day, I had 38 gold pieces, I was level 4 and nautical level 1 and still a rank of Castaway. On the third I hung around Jonah for flying fishing. The last batch of them took out me out but Shen got us safely back to port and more importantly the gold. I made nautical level 2, earned my Ensign badge and we did a little crew training and then set off to get Terry from the Cutthroats. I attacked Cutthroat The Threepenny Rake but had to run for the skylane because a Monquistan joined in to help them. We took another run at the Rake and this time fought her till they boarded us. Once again I was beaten but Shen saved the day. And the gold. Oh, and Terry too. I took out Cutthroat The Lonely Dawn but they didn’t give up the lute I was looking for. Was a long sea battle before we boarded them. We then faced Cutthroat The Royal Viper. For some reason we couldn’t fire our cannons, but we beat them after they boarded us. They did have the lute. Must have made the Cutthroats mad because there was a whole armada firing on us as we high-tailed it to the lane. They seemed to be able to see us even as we were invisible. After that we went to Jonah for some crew training, shopping and fishing and then off to blood shoals. We took on some jobs from the Ratbeard’s late crew. We took on and boarded Cutthroat The Lonely Prize, making short work of her crew. Then we took on another Cutthroat but the mysterious sickness took us right in the middle of the battle. When I came to, we were in the middle of an armada of Cutthroats. Shen and Annie were both down and I was barely alive enough to beam us out to Blood Shoals. I don’t like getting shot up while I’m sleeping. I took it out on The Blue Tiger and The Laughing Dawn. The Dawn went down before I could board her but I got all the rope I wanted. We beamed to Skull Island and took out Buster Crab, saving Young Nick in the process. After sundry business back in Blood Shoals we beamed back to Skull Island and trained Annie to level 6. She became the new first mate. We made upgrades on the ship and myself. I’m level 6. We took off to Jonah and took out Cutthroat The Joyful Robin which took me to nautical level 3. From there we went to save Brody in the Vortex of Doom. Due to a bad tactical error, Annie went down. I shouldn’t have moved her so close to the fight. We went to Rapa Nui and took on some more work. We sailed out to take on the Waponi ships. Mos Tiki and Mau Hune were first. In both cases we created a great tactical formation, making an “L” on the running boards with Annie at the bottom. This invited the enemy to line up in the crotch of the “L” for Annie’s scatter blast. Cho Mooga was tougher. I made the same L formation, this time with Shen in the bend. It became clear that they weren’t going to line up for us so we moved the L to the other end of the running board. With me on point they all ganged up on me. Worse, Shen took a beating, tried everything I had to save him but he still went down. Fortunately we still managed to beat them back. This series was the longest seaborne engagement I’ve made. Beamed back to Rapa Nui. Sold my loot. Went to Jonah to get the Coral Billethead. Since we didn’t find a Waponi on the way out, did some batacuda fishing instead. Took out a Waponi ship, didn’t get the name. Then the Pino Fiji. That was a tough fight so we had to beam back to Jonah afterwards. Ran into some batacuda on the way back to Rapa Nui. Somewhere during the battles I earned my Manini badge. I got a Mojo Potion. Beamed over to Skull Island to save Norville. On the way back to Jonah we did a bunch of contract flying fishing. I made level 7. Final bit of business for the day was to beam back to Skull Island for training. I trained for Slashy Weapons and Gunnery. Shen made level 6 and is first mate again. On the Fifth I did some more contract flying fishing on the way to Jonah. Took out three batches. Took quite a beating for that but I got all I needed to complete Feed Me!. I now have more gold than I have ever had, 352 pieces. After some more training for Emmett we went down to Gullet to meet the Frogfather. To do that we had to beat up one of his crew, Rocco. Fairly easy fight. After meeting Frogfather we started Quid Pro Quo for him. We were to head off to Rapa Nui, but as we tried to set sail the strange sickness took us again. Fortunately this time we were still moored and woke up on the boat. Unfortunately as we set sail we decided to take on the Waponi Leluina and the strange sickness took us again. When I awoke I was just east of Jonah. Several of my crew were out and I was only barely alive enough to beam to the fountain in Jonah. There I revived Annie Emmett and Nanu. But… I still have me gold. Now, there is a Waponi boat out there that thinks they got away. We’re off to fix that, and then to Rapa Nui. Ran into the Cutthroat The Jolly Piper, made quick work of them. Had a good tactical position with me and Nanu jamming up the running board and Emmett safe behind us. Earned my Gray Reaver badge. I delivered the Yumba Potion to Uma-Guma. Completed Tummy Troubles and then set sail for the Presidio. Good thing I avoided any action, there’s no life fountain at the Presidio. Earned my Pirate Adventurer badge. Snuck past first guards and killed the next batch quickly and repeated that pattern sneaking again past 3rd set and taking out the 4th set with ease. Had to fight Captain Santiago in the storehouse, fairly tough but I was tactically on target. Had to be patient to get a couple yums before taking on the guard in the courtyard. They went down quick. Then we took out the guard in the barracks. Finally we met El Nebuloso who was no match for us. We saved Dead Mike and took out the final set of guards in the storehouse. Monquistan Dona Felicia was in the way on the way to the skylane. Would have been better for her if she had run. Put in to Skull Island to count my loot. On the way back to Jonah we found the Waponi Leluina. She was not lucky this time. Went to the Golden Fin Tavern to do some crew training. Unfortunately the strange sickness fell on us as we entered the tavern. We passed out without even taking a drink. When we came to, we trained Emmett closer to level 6. Went to see Frogfather and completed Quid Pro Quo. I moved to level 8 and Dead Mike joined my crew as we started One-Eyed Jacks are Wild. Beamed to Skull Island for training. Trained for Tough and then headed to the Buccaneer’s Den to train for Smashy Weapons Rank 1. Mike got new talents: Tough and Rough. Emmett trained to level 6 and Shen to level 7. Mike is 1st mate replacing Nanu and Emmett is 4th replacing Annie. Started A Priceless Antique. Set out to get Mew’s telescope. Took out Cutthroat The Laughing Dawn but they didn’t have it. The Lucky Dawn did give up the scope. On the way to Jonah I took on the Waponi Hanu Baina and the strange sickness took us again. When we came to, we were miraculously unscathed and drifting just north of Rapa Nui. Docked just to be sure. 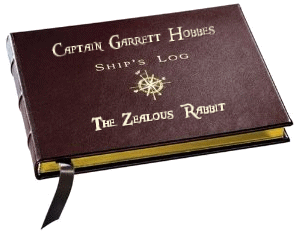 Headed back to Jonah where I received the skiff The Zealous Rabbit. Costs 400 gold pieces to get rid of that ridiculous name, so obviously I like the name now. Headed to Skull Island to give Mew his telescope and then did some flying fishing from the new boat followed by taking out the Cutthroat Swift Chance. The Cutthroat Blue Tiger took shots at us but we passed them by. At the end of the day I’m level 8 and a level 4 ensign with 238 gold pieces. © 2013 A Pirates Portal; Evil Wordsmith/Captain Garrett. All Rights Reserved.